In case you missed it, Gallup released a revealing poll recently showing just how bad the regulatory nightmare has become for America’s small businesses. According to the poll, the number one concern among small-business owners in the United States today is-you guessed it-complying with government regulations. Almost a quarter of respondents said this is the most important problem facing them today. To make matters worse, the regulatory gorilla is on a feeding frenzy with policymakers only too happy to feed its insatiable appetite. And the cost is substantial. According to a study for the Small Business Administration, regulations add a staggering $10,585 in costs per employee. In an age of fierce global competition, this is a cost America can ill afford. While President Obama has acknowledged the need to minimize regulations, the number is still mushrooming out of control. Obama administration regulations on new business rose to 3,573 final rules in 2010, up from 3,503 in 2009-the equivalent of about 10 per week. Meanwhile, the 2010 volume of the Federal Register stands at an all-time record-high 81,405 pages composed of final rules, proposed rules, meeting notices and regulatory studies! is college about substance or certificates…. Census data show that an associate’s degree in engineering or computers is worth as much or more, on average, than a bachelor’s in education or the liberal arts. An associate’s degree in engineering yielded $4,257 in monthly earnings in 2009, compared with $4,000 for a bachelor’s in the liberal arts and $3,417 for a bachelor’s in education. A two-year degree in computers fetched $4,000 a month, the same median earnings as a four-year degree in the humanities. Even a vocational certificate, a credential that generally requires months — not years — of school, can yield more future earnings than a bachelor’s degree in a low-paying field. Employees with construction certificates earned $4,904 a month in 2009, better than the median pay for a bachelor’s in the humanities. While the ECRI boasts a solid forecasting record over the past 20 years, the firm is not without its critics. Primarily, detractors say the ECRI uses undisclosed “black box” projections about which it is not forthcoming. Annualized gross domestic product growth is slowing, he said, as is personal income, sales, and industrial production, all of which he sees amounting to a recession by mid-year. Capital sees growth this year below 2 percent and only slightly higher in 2013, but is not forecasting a recession. Goldman Sachs economists, though a bit more sanguine about the future, nonetheless see slow growth in the 2 percent range that also could be fragile. The manufacturing crisis, if that’s the word, has been jobs. Industry employed one of three workers after the war. Today, it’s one of eight. Yet this, too, is largely a measure of economic progress—because it is the result of productivity gains. Productivity is the basic measure of how much we can do with our resources, human and monetary, and increasing it is what drives wage gains and higher standards of living. 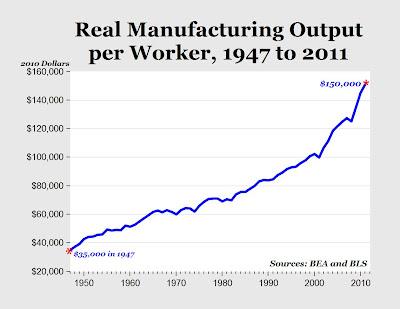 Real manufacturing output stood at about $35,000 per worker in 1947, in constant dollars. It doubled by 1980 as companies became more efficient. 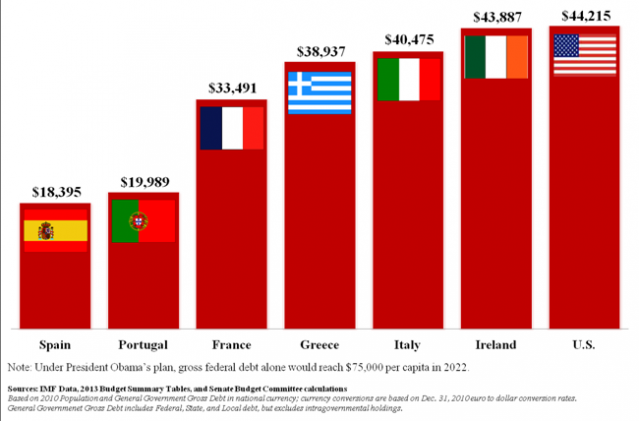 Today this measure is an astonishing $150,000 (see chart above). Manufacturing productivity has increased by 103% since the late 1980s, outpacing every other industry and double the 53% in the larger business economy. This translates to gains for consumers: Prices for manufactured goods have declined 3% since the 1990s, even as overall prices rose 33%. A recent report by Deloitte for the Manufacturing Institute, based on a survey of manufacturers, found that as many as 600,000 jobs are going unfilled. By comparison, the unemployed in the United States number 12.8 million, according to the Bureau of Labor Statistics. “It’s a glamour issue,” said Dave Van Dam, 37. “The kids come in here and see a dirty, loud place. We get oil on ourselves. Then they go upstairs and they see the designers in their cubicles with two screens and headphones on listening to music. The funny thing is, Van Dam said, that a skilled machine operator makes more than a designer. Pay for skilled operator-programmers runs from $18 to $28 per hour; the designers upstairs make $14 to $24. 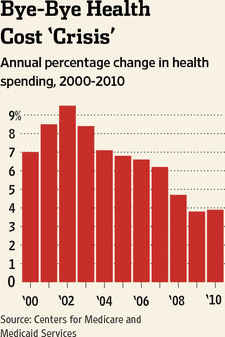 The growth rate of national health expenditures has been declining for a decade, driven by better medical care and consumer choice. What does our investment in education buy? What follows is a “first approximation analysis”. The numbers could be done with more precision, but they are good enough to give us an idea of what the nation has been getting (actually, not getting) for its massive “investments” in education. Assuming that about 25% of our total population is in school at any one time, average real (2010 dollars) government spending per student rose from $1,763 in 1951 to $12,209 in 2009. This is an increase of about 7 times. Assuming an average of 13 years of education per student (some go to college, some drop out of high school), this means that during this 58-year time period, we increased our real “investment” in the human capital represented by each student from $22,913 to $158,717. Meanwhile, we have also been investing more in physical capital. Real nonresidential produced assets per worker increased from $79,278 in 1951 to $206,717 in 2009. So, each worker in 2009 had $127,439 more in physical capital and $135,804 more in educational “capital” to work with than he did in 1951. Unfortunately, it is clear from the numbers that GDP tracks only physical assets, and not the sum of physical assets and educational “assets”. Excluding the GDP produced by the housing stock, the ratio of GDP to nonresidential produced assets has been essentially constant over the 59 years 1951–2009 (it has oscillated with the business cycle around a midpoint of 48.2%). 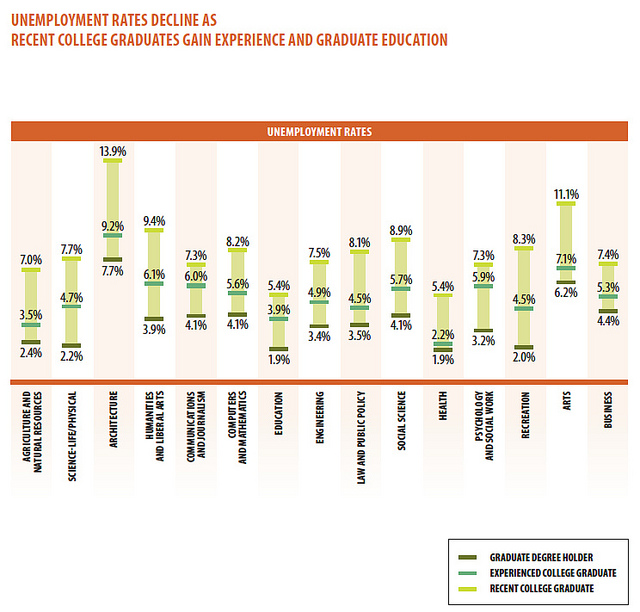 So, it appears that our massive “investments” in education have produced no measurable economic return. Should we be surprised by this? No. Average scores on standardized tests have not risen, despite the fact that we are “investing” seven times as much in real terms in each student than we did six decades ago. So, even by the measures used by the educational establishment, it is clear that the higher spending has not created any additional human capital. Let’s start with innovation, which is the force that powers long-term improvements in our standard of living. 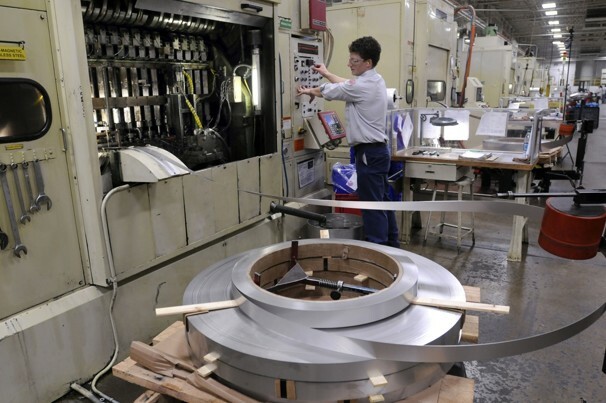 Here, manufacturing strongly outperforms the rest of the U.S. economy. Manufacturers are responsible for more than two thirds of all company-performed domestic research and development spending, even though they only generate about 11 percent of America’s GDP. More than a third of all U.S. engineers work in manufacturing. And about 22 percent of all manufacturers introduced a new product or service between 2006 and 2008, compared to 8 percent of non-manufacturing firms.